If you’ve been to Black Mountain more than once, you’ve probably been to “Blue Cone” aka Dairy King. It’s a small soft serve ice cream stand that is extremely popular with our staff on their nights off. One of their favorite things to order is the Arctic Swirl, which is a milkshake with ‘mix-ins’ like Reese’s Peanut Butter Cups or cookie dough or brownies. So, when we thought about making milkshakes, it seemed like we should try to replicate these fantastic frozen treats. We got GALLONS of vanilla ice cream, milk, chocolate chips, M&M’s, and Oreo’s and used our stick blenders to create our very own Merri-Mac Mix Ups. I love granola bars! I think they are perfect for breakfasts, lunchboxes, snacks, dessert… On any given day, if you asked, there’s a good chance you’d find a granola bar of some sort in my purse…or the glove compartment of my car…or both. I love to try different brands and types of granola bars, but what I really wanted to do with the campers this summer was to make a good basic granola bar that would be a jumping off point for their own variations at home. I think this recipe is perfect for that. It’s adapted from the Pioneer Woman’s granola bar recipe—I made a few adjustments including removing the nuts and adding sunflower seeds and chocolate chips. I also used a combination of wheat germ and wheat bran; I think ground flax seed would also be delicious. The Pioneer Woman also recommends dipping the bottom of the granola bar in melted chocolate—I’m going to try that when I make my first batch back home! Toss oats with melted butter, salt, and cinnamon. Spread them on two trays and place in oven. Bake for 15 minutes, shaking pan every 5 minutes. TURN DOWN oven heat to 325 degrees. In saucepan over medium heat, mix brown sugar, honey, apple juice, molasses, and vanilla. Stir until sugar is melted and mixture is smooth. In large bowl, mix rice krispie cereal, wheat germ, wheat bran, sunflower seeds, chocolate chips, oats, and dried fruit (if using). Pour sugar mixture over cereal mixture, stirring quickly to combine. Press into greased pan and bake for 20 minutes. Allow to cool for 20-30 minutes and cut. We almost didn’t make this at camp this summer, but I am so glad we did. I was looking for a recipe that would take even less time than our usual hour for the first two classes of the session—we lose some time during those classes taking attendance for the first time, checking camper allergies, reviewing the safety rules for the kitchen, etc… I wanted something that the girls would enjoy, but could cook quickly. One of the senior staff jokingly said; why don’t you just make chips and salsa and I almost dismissed the idea…but then I got to thinking…my kids love chips and salsa…and they love queso dip…what if we made that? And so we did! Our first batch of salsa was pretty spicy—my apologies to your daughter if she was in first period cooking on Monday, but we lightened up on the jalapeno peppers and increased the lime juice and the resulting salsa was just right. The recipe makes a huge batch of salsa and it keeps well for days. The queso dip was an even bigger hit—many of the girls have said that it was their favorite thing that we made this session. Next year, I think we’ll double the recipe. By removing the jalapeno seeds AND sautéing it AND incorporating it into the cheese, it had very little bite and all of the girls loved it…even the ones who looked sideways at me when we began chopping up those onions, peppers, and tomatoes to put into their yummy, melted cheese dip. The original recipe had a lot more cilantro, so feel free to add more according to your taste. We also used quite a bit more half and half to get the sauce the consistency that we were looking for. Enjoy! 1. Place ingredients in food processor. Pulse 10-15 times, depending on the consistency you would like your salsa to be. 2. Better if refrigerated for about an hour—serve with tortilla chips. 1. Heat oil and sauté onion and pepper until softened, on medium low. 2. Add shredded cheese, half and half, tomatoes and cilantro. 3. Serve warm—with tortilla chips. I don’t think I’ve ever met a child who didn’t like donuts, so it seemed like the perfect thing to make at camp. My concern was having the campers deal with hot oil and deep frying, so I began experimenting with baked donut recipes and once I found a few good ones, I ordered mini donut pans online and we were off and running. The campers have made two kinds of donuts this summer: chocolate and pumpkin. 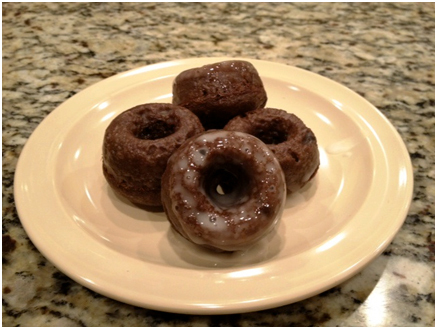 The chocolate donut recipe is a compilation of a couple of different recipes I found online. The pumpkin donut recipe is from the King Arthur Flour website (Pumpkin Cake Doughnuts). The glaze for both is from the Pioneer Woman—for the pumpkin donuts, we added a little cinnamon and allspice to the glaze. It would be hard for me to tell you which one they preferred—you might just have to make both! NOTE: The secret to filling those tiny donut pans is a Ziplock bag. Once the donut batter was made, we put it in a quart bag and snipped off a small corner. The campers used this as a piping bag to fill the donut pans and once they got the hang of it, it was a breeze! Preheat oven to 350 degrees and spray donut pans with cooking spray. Whisk together egg, milk, vanilla, and white vinegar. Add flour, cocoa powder, brown sugar, baking powder, baking soda, salt, and cinnamon and blend together. Add chocolate chips and finish blending. Pour batter into Ziplock bag and cut a small triangle off the corner of the bag. Pipe the batter into donut pans so that they are half full. Bake 7-8 minutes. Allow to cool 2-4 minutes. Dip in glaze or dust with powdered sugar. This was one of our most popular recipes last summer and somehow we forgot to post it. The girls loved making them and I loved teaching them a healthier way to make fries—they turn out amazingly crispy for oven fries. 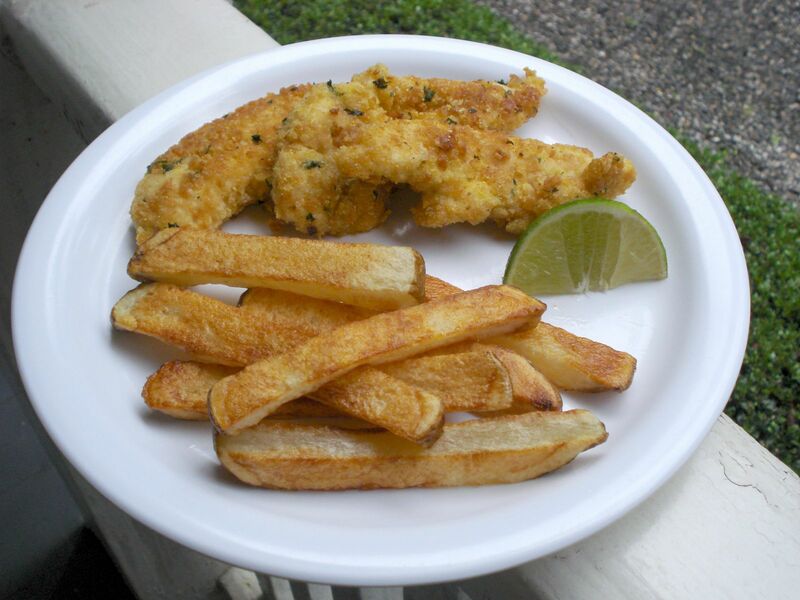 We were going to make it again at the end of first session this summer, but our food supplier accidentally sent us breaded frozen chicken tenders instead of uncooked chicken tenders (so we made chicken parmesan tenders instead and they were yummy too). Anyway, we’re going to make them again second session and the girls keep asking me for the recipe…so here it is. I think the below recipes would serve 8-10. Rinse chicken tenders and pat them dry with a paper towel. Crack eggs in shallow bowl and whisk. Put crackers in Ziploc bag, remove air, seal, crush with rolling pin. Pour crumbs into shallow bowl. Heat margarine and olive oil in sauté pan over medium heat. Working a batch at a time, dip tender into eggs, then into cracker crumbs. Gently place in sauté pan. Cook until lightly brown. Turn and cook until done, about 5 minutes—lower the heat if they start becoming too brown. Remove from pan and hold in warm (250 degree) oven until all tenders are cooked. Slice Idaho potatoes into slender strips and place in shallow microwaveable dish—cover with water. Remove from water and dry on layers of paper towel. Place potatoes in large Ziploc bag, add olive oil and toss to coat potatoes. Spread potatoes out on baking sheets in single layer. Bake at 425 for 20 minutes, or until golden brown, flipping/turning potatoes at least once. Remove from oven and season with salt. It was the last week of camp last summer and we had cooked our little hearts out. We had made everything from pancakes to baked ziti, from chocolate chip cookies to pasta pesto…and we were tired…but we still had two more classes…and we felt like we’d earned a treat. Ice cream sundaes sounded like just the thing and this hot fudge sauce is the one my mother made when we were kids. It was a great way to end the summer!! Remove from heat and add vanilla—don’t forget the vanilla! Serve over chocolate, vanilla, and/or strawberry ice cream with other toppings, including caramel sauce, strawberry sauce, whipped cream, M & M’s, and a cherry. One batch made enough hot fudge sauce for about 15 people. Last summer, towards the end of the summer, Emily and I sat down and made a list of foods we wanted to cook with the campers, but had run out of time for. 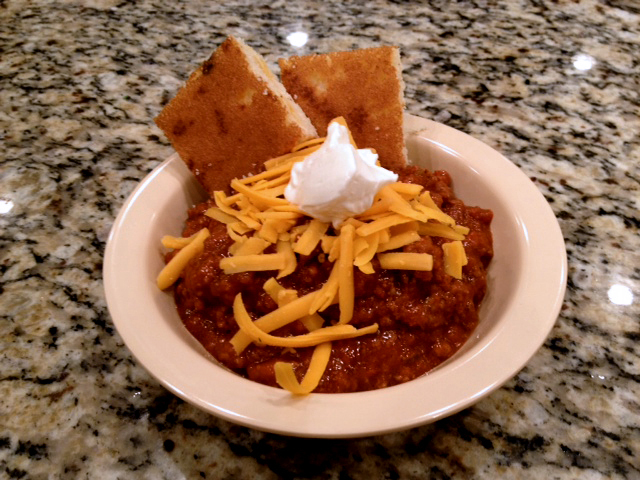 Chili was on that list, but I had some reservations about whether or not the campers would like it. I should not have been concerned—they have loved it! Especially topped with cheddar cheese and served with a big piece of cheddar cornbread. And yes, for those of you who haven’t already picked up on this…when I can’t add chocolate chips to something, I add cheese! Cheese and chocolate…they make EVERYTHING better! 1. In large pot, put olive oil, onion, green pepper, garlic green chilies. Sauté until soft-about 10 minutes. 2. Add ground beef and sauté until fully cooked. Drain excess oil. 3. Add crushed tomatoes, tomato paste and spices. Add beans if using. 4. Simmer over low heat 30-45 minutes. 5. Serve with shredded cheese and sour cream. NOTE: Our chili was a little thick, so we added some additional water. I think it depends on how much liquid is in your crushed tomatoes. You may also adjust the spices—Emily liked it with more cumin and a touch more salt! Combine cornmeal, sugar, buttermilk, and egg. When butter is cool, add butter and cheddar cheese—mix to thoroughly combine. Spray muffin cups with cooking spray. Place one small ice cream scoop of batter into each cup. This recipe can also be made in a single pan, instead of in muffins. Very good with 6 slices of bacon crumbled, and/or 2 Tablespoons chopped chives. Waffles are an old camp favorite. We used to have waffle irons in the dining room and we recently rediscovered them and moved them into the cooking kitchen. We had a great time making waffles in class and both Merri-Mac and Timberlake have been signing up for evening cabin waffle parties. We made our waffle batter from scratch. Separating and whipping the egg whites is a must for making a crispy waffle. Substituting ¼ cup of corn starch for ¼ cup of the flour makes them even crispier! The campers love topping them with syrup, whipped cream, and mini chocolate chips. Turn on waffle irons and spray them with cooking spray. In medium size mixing bowl, whisk together the flour, sugar, baking powder, and salt. Gently stir in buttermilk, canola oil, egg yolks, and vanilla. In a separate bowl, whip egg whites until they form soft peaks. 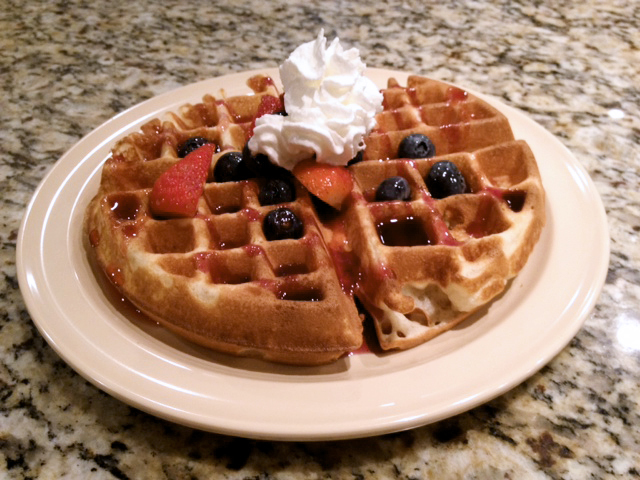 Pour batter onto heated waffle iron and bake according to waffle iron directions or until golden brown. Carefully remove waffle and serve immediately with maple syrup, whipped cream, fruit, chocolate chips, or powdered sugar. A few words about quesadillas… I think they’re a lot like pizza in that you can use whatever fillings or toppings you like and they’re a great thing to make with a group because everyone can make their own exactly the way they want it. When we made them in class, the campers could fill them with chicken, spinach, mushrooms, peppers, and/or cheese. We also had cilantro, Chipotle chili powder, cumin, salt and pepper. As with pizza, my personal favorite was ‘everything’! Several of the girls asked me how I made the chicken—it was marinated overnight in olive oil, red wine vinegar, Dijon mustard, fresh herbs—rosemary, oregano, basil, garlic, and parsley—and lemon juice. We served our quesadillas with salsa, guacamole, and sour cream…life is good!! Heat griddle to medium heat, sprinkle with olive oil or spray with cooking spray. Place one flour tortilla on griddle. Top with chicken and/or vegetables, cheese, and seasonings. Place second flour tortilla on top and brush with olive oil or spray with cooking spray. Cook until bottom tortilla is golden brown, and then flip. Cook until second tortilla is golden brown and cheese is melted. Remove from griddle and use pizza cutter to cut into quarters. Serve with guacamole, salsa, and sour cream. -Leslietocking full of candy and Krispy Kreme donuts to start their day. We also wanted to keep the spirit of Christmas in cooking class and so Christmas pasta was invented-spaghetti with red sauce and green sauce! When we first told the girls we were making GREEN pasta sauce, a lot of them turned up their noses, but by the end of class a majority of them loved it and some even preferred it to the red sauce. You could also use these sauces as a great jumping off point for other recipes. We froze the red sauce and used it later in the week in our vegetable soup and the green sauce is great with grilled chicken and roasted vegetables. Merry Christmas Merr-Mac! P.S. The other surprising thing for many of the girls was that they LOVED the red sauce, even though it was chock full of those dreaded vegetables! Sometimes the food processor is your friend-my kids have been unknowingly eating these vegetables for years!! Clean, cut, and place in food processor to finely chop. Add crushed tomatoes, bay leaves, oregano, and basil. Simmer for 30-90 minutes. In the last 10 minutes add additional S&P and chopped fresh herbs. Additional grated or shredded parmesan cheese for sprinkling on top of spaghetti. All the Recipes from the Merri-Mac Cooking classes in this post! -Leslieen my favorite thing to make. Personally, I’d rather eat a delicious, chewy cookie or a rich, moist cake—a brownie-in my opinion-has always seemed to be somewhere in between and not as satisfying as either. To compound matters, both of my children prefer the box-mix brownies to anything I’d ever baked…so what was the point? This past year, however, having decided that I wanted to add brownies to the camp cooking schedule, I was on a mission to find the perfect brownie recipe—not too cakey, not too fudgy, not too sweet, but plenty of chocolate. The following is the camp brownie recipe. My children have declared it to be ‘as good as the box kind’, which from them is high praise AND the campers and staff ate them as fast as we could get them out of the pans. I do believe we have a winner! Preheat oven to 425 degrees. Spray rimmed baking sheet with cooking spray. Line with parchment paper and spray again with cooking spray. Sprinkle with flour and spread flour over bottom and sides of pan. 2. Over low heat (or in double boiler) melt stick of butter and 5 ounces of chocolate (or about ¾ cup semi-sweet of chocolate chips). Set aside to cool. 3. Whisk together white sugar, brown sugar, vanilla and eggs. 4. Slowly pour cooled chocolate/butter mixture into sugar/egg mixture, whisking as you pour. 5. Sift dry ingredients into wet ingredients—flour, cocoa powder, and salt. Stir just until combined. 6. Gently fold in ½ cup semi-sweet chocolate chips. 7. Pour brownie mixture into buttered and floured pan, spreading batter evenly. 8. Bake at 425 degrees for 10-15 minutes. Reduce heat to 350 degrees and bake an additional 10 minutes. Cool, invert onto cutting board, remove parchment paper, and cut into squares. NOTE: I make spread them out thin in a rimmed baking sheet because they cook more quickly and time is a factor here at camp (we have to be able to make-bake-and eat in our one hour class). You could also make a thicker brownie in a smaller pan-just adjust the cooking times. We’ve been cooking some old favorites these past two weeks—macaroni and cheese, pigs in blankets, hot dog octopi (1/4 hot dog with 4 strands of spaghetti poked through-dropped in boiling water—if you haven’t tried this at home, you really should, just for the humor of it! ), and pasta pesto with roasted vegetables. These recipes may all be found by searching for “Leslie’s Cooking Corner” on the camp news. In addition, we have two new recipes that we believe are destined to become part of the family of camp favorites! The first is so simple; I didn’t even give the girls a recipe for it. 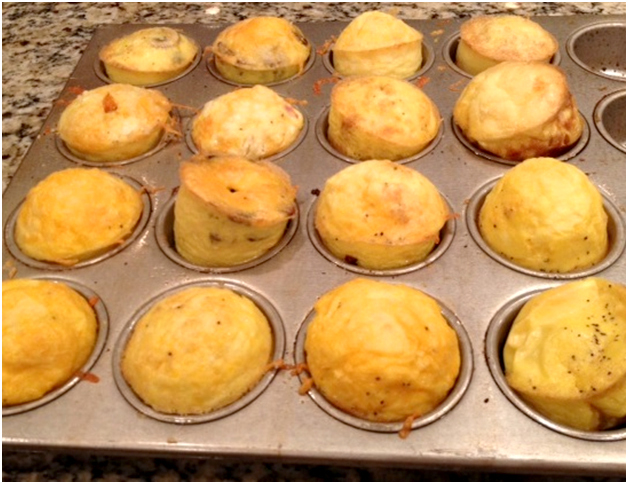 We called them Egg Cups or Egg Muffins because they came out of the oven looking just like muffins. All we did was spray a muffin pan with cooking oil and drop in 1-2 teaspoons of filling like diced ham, crumbled cooked sausage, sautéed onions, peppers, or mushrooms. Then, after each girl cracked her own egg into a bowl and scrambled it with a fork, she poured it into the muffin tin on top of her filling. We added a tablespoon of grated cheese and salt and pepper. They baked for about 10 minutes at 425 and when we took them out, they looked like this and tasted DELICIOUS! Our other new favorite is MUFFINS! We made blueberry, chocolate chip, cranberry orange, and crumb-cake muffins—all using the same basic muffin recipe. We have been so happy with how these muffins turned out—and by ‘we’, I mean all of the girls in cooking AND all of the staff who stop by the kitchen for the leftovers—that we have had to make double batches in a couple of classes! The following recipe makes 8 muffins—I usually make a double batch at home. Preheat oven to 425 degrees. Spray muffin cups with cooking spray. 2. Sift together: flour, sugar, baking powder, and salt. Stir in lemon zest. 3. Stir in buttermilk, egg, canola oil, and vanilla until just blended…do not over-mix. 5. Bake at 425 degrees for 5 minutes. Reduce heat to 375 degrees and bake an additional 15 minutes. 6. Remove from pan and drizzle with glaze. Substitute orange zest for lemon zest, add dried or fresh cranberries, mix juice from orange with powdered sugar for glaze. Mix ¼ cup flour, ¼ cup brown sugar, ¼ stick butter, 1 teaspoon cinnamon to make cinnamon streusel. 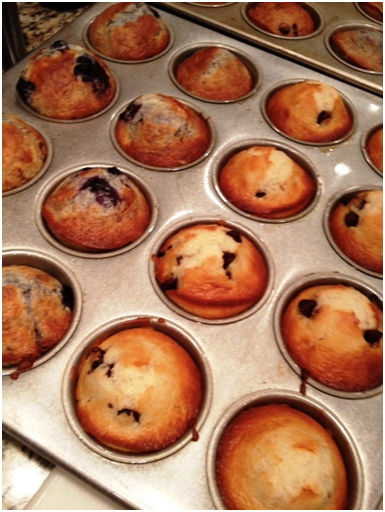 Use streusel to top blueberry muffins or layer in plain muffins: muffin dough, streusel, muffin dough streusel. A few words about French toast… My mother always makes French toast with vanilla. I’ve always used cinnamon sugar, but I found recipes that called for honey. Add the flavoring of your choice and see which one your family prefers. We made three versions of French toast, although I’ve only posted the recipe for the basic one. We also made it with cinnamon raisin bread and we made stuffed French toast. The stuffing was a strawberry cream cheese (we made our own, mixing strawberry preserves and cream cheese) which we placed between two slices of bread, then dipped the whole ‘sandwich’ in the egg batter and cooked it. We topped that with strawberry syrup and fresh strawberries. Yum, yum! • In medium size mixing bowl, whisk together the milk, eggs, cinnamon sugar, and salt. You may do this the night before. • When ready to cook, pour egg mixture into a pie pan. • Over medium heat, melt butter in a 10-inch nonstick sauté pan or griddle. • Place 2 slices of bread at a time into the egg mixture and soak about 30 seconds. • Carefully move from egg mixture to griddle and cook until golden brown, approximately 2 to 3 minutes per side. • Remove from pan and serve immediately with maple syrup, whipped cream, fruit, and/or powdered sugar. A few words about banana bread… For this recipe, it is important that the baking soda dissolves in the buttermilk (or milk). You’ll know this has happened as you are stirring it together and it begins to foam—this is the reaction you’re looking for—so plan on putting the baking soda and buttermilk in something bigger than a one cup measuring cup, right girls?! At home, I add ½ to 1 cup of ground pecans to this recipe (it’s my grandmother’s) and it gives the bread a wonderful crunchy texture and added flavor. At camp, however, we’re keeping our cooking kitchen nut-free to avoid any allergies, so we made it without nuts and everyone still thought it was delicious. If your daughter mentions some weird kitchen gadget that we used to puree the bananas, it’s a stick blender. Our bananas weren’t as ripe as they could be for banana bread, so we used a stick blender to puree the bananas, and then blended them with the sugar and margarine. At the end of the day, we had a great time making the banana bread and everyone at camp had a great time eating it. We hope you’ll do the same at home! • Preheat oven to 350 degrees. Grease and flour one 8” loaf pan. • Dissolve baking soda in buttermilk and set aside. • Cream sugar, margarine, and bananas. • Add buttermilk/soda mixture, stir well. • Pour into loaf pan. Bake for 45-50 minutes. Allow to cool before slicing. Note: makes 1 large loaf, a double batch makes 3 perfect/medium loaves. A few words about chocolate chip cookies… Well, one word, really: INGREDIENTS! The better your ingredients are, the better your cookies will be. I use butter—only…except when I have to make several hundred for school, and then I’ve been known to use half butter and half margarine to cut down on expenses, but the butter is REALLY much better. Please use real vanilla and not imitation vanilla extract. The brand I use at home is Nielsen-Massey. Janey, our hostess, uses a Mexican vanilla she ships to the states by the case. I have a friend at home who boils vanilla beans—whatever your choice, make sure it’s real and not imitation or vanilla flavored. For a sweet and salty cookie, try using sea salt instead of regular salt. It gives the cookies a little extra crunch and there’s something wonderful about biting into a chunk of salt and a rich chunk of semi-sweet chocolate at the same time. And finally, the chocolate chips…I’m a big fan of Nestle’s Toll House semi-sweet chocolate chips, but there are other wonderful rich chocolate chips out there for you to try. So, spend a few extra minutes making sure you’re using the best ingredients, then enjoy filling your cookie jar and watching it empty! • Preheat oven to 375 degrees. Line baking sheets with parchment paper. • In medium size mixing bowl, cream butter, sugar, and brown sugar until it is light and fluffy, about 3 minutes. • Add eggs and vanilla and beat for another 2 minutes. • Add flour, baking powder, baking soda, and salt and mix until all ingredients are fully blended. • Add chocolate chips and mix to distribute throughout dough. • Use small ice cream scoop to drop rounded scoops onto lined baking sheets. • Bake 10-12 minutes or until golden brown. • Remove and cool on wire rack. • Preheat oven to 450 or 475 degrees. • Mix water and yeast. Let rest about 5 minutes. • Add salt, sugar and olive oil and blend well. • Add flour and mix to combine. Place into lightly oiled bowl. Let rest about 5 minutes. • Oil pizza pan and sprinkle lightly with corn meal. • Bake dough 5 minutes. • Remove from oven and top with pizza sauce, toppings and cheeses. • Bake 7-10 additional minutes. 2. Line 9” pie pan with one piece pie crust. 3. Mix sugar, flour, cinnamon. Add berries, gently folding together. 4. Pour berry mixture into pie crust. 5. Sprinkle lemon juice over berries. Cut butter into small chunks and dot over berries. 6. Cut second piece of pie crust in strips. Weave into a lattice top. Crimp edges together, trimming excess crust. Cover outside edge w/strips of foil to prevent burning/overbrowning-remove foil for last 15 minutes of baking. 7. Bake 35-45 minutes or until crust is golden brown and juice is bubbling. NOTE: Peach pie uses 5 cups of peaches and the full cup of sugar. The crumb topping is: 1 cup flour, ½ cup margarine or butter, ½ cup packed brown sugar, ½ cup oats, 1 teaspoon sugar. Mix until crumbly and distribute over top of peaches. You may need to cover topping with foil towards the end of baking. 1. Place basil, pine nuts, and garlic in blender, pulse to chop. 2. Slowly drizzle olive oil into mixture, blending/grinding to make a smooth paste—the oil should be fully incorporated. 3. Add parmesan cheese, salt pepper, continue to blend. 1. Cook linguini or other pasta, drain, toss with olive oil. 2. Chose an assortment of fresh vegetables (we used red peppers, mushrooms, zucchini, squash, onions, broccoli, tomatoes)—clean and cut into chunks. 3. Place on a rimmed baking pan, drizzle with olive oil and your choice of herbs. 4. Roast at 450 degrees for about 15 minutes or until beginning to brown. 5. Toss pasta, pesto, and roasted vegetables together. Top with additional grated parmesan cheese or chunks of feta. 6. Serve with a mixed greens salad and fresh bread—yum! 2. Cream butter with electric mixer. Add sugar and beat until light and fluffy. 3. Add egg yolks, beating well. 4. Mix in flour and salt. 5. Shape dough into flat disc and chill at least 1 hour. 6. Remove dough from refrigerator and roll ½ at a time. Roll to 1/8” thickness and cut into shapes with cookie cutters. 7. Decorate with colored sugars. 8. Bake for 8-10 minutes or until lightly browned at edges. *You may also decorate these cookies with icing. We mixed powdered sugar, milk and food coloring to make red and green icing that we drizzled over the cookies in ribbons. **You will notice that this recipe uses only the egg YOLKS. I save the whites and make meringue cookies. The recipe we used this summer is Emeril Lagasse’s Forgotten Kisses . We made one batch plain, one batch with a cup of mini chocolate chips, and one batch with a cup of crushed peppermint candies (our favorite). They turned out the best when I preheated the oven to 250, put them in, turned the oven off, and left them overnight. 2. Line muffin pan with 14 paper liners. 3. Mix flour, sugar, cocoa powder, baking soda and salt. 4. In a separate bowl, mix water, oil, and vanilla. 5. Mix wet ingredients into dry ingredients. 6. Fill each paper liner about 2/3 with batter. 7. Sprinkle 1 teaspoon (about 6) chocolate chips on top of each cupcake. 8. Bake about 20 minutes or until a toothpick inserted in cupcake comes out clean. 9. Remove from pan and allow to cool completely before frosting. 1. Beat butter with an electric mixer until light and fluffy. • Preheat oven to 425 degrees. Butter a 9 x 12 baking dish. • Boil 4 quarts of water. Add macaroni, a dash of salt and a splash of oil to keep noodles from sticking together. Drain macaroni when it is al dente (almost cooked but still firm) and set aside. • Melt butter over low heat in deep sauté pan. • Add flour, one tablespoon at a time, whisking after each tablespoon. You are creating a roux—a thick, smooth paste. Allow roux to cook for a few minutes, but don’t brown. • Add milk SLOWLY, whisking continuously to remove any lumps. Continue stirring and cooking roux until it thickens again. • Add dry mustard, salt and cheese. Stir until all cheese is melted, then remove from heat. • Mix cheese sauce and pasta. Pour into baking dish. • Bake for 15 minutes, or until top is golden brown. Optional: Sprinkle plain buttered bread crumbs on the top before baking for a nice crunch. • Preheat oven to 400 degrees. Butter a 9 x 12 baking dish. • Boil 4 quarts of water. Add ziti, a dash of salt and a splash of oil to keep noodles from sticking together. Drain ziti when it is al dente (almost cooked but still firm). Mix 1 ½ cups of sauce—enough to coat—and set aside. • In sauté pan, add 1 Tablespoon of olive oil and sausage or ground beef. Break into small chunks and brown well. Drain excess grease and set aside. • In a separate bowl, mix ricotta, egg, basil, oregano, and salt until smooth. • Spread a thin layer of sauce on the bottom of the baking dish. Place half of the pasta over the sauce. • Spread ricotta over top of pasta. Sprinkle all of the sausage or ground beef over ricotta. Top with ½ cup shredded mozzarella. • Add the rest of the pasta with sauce. Top with remaining plain sauce. • Sprinkle top with remaining mozzarella cheese and parmesan cheese. • Cover with foil and bake covered for 20 minutes. Uncover and bake for remaining 10 minutes. A few words about Pancakes… Some mornings I wake up and fondly think back to the days when making pancakes at my house involved adding water to a mix instead of dirtying three separate bowls and running to the store if I don’t have a lemon…but then, I take a bite of these delicious pancakes and know that they are totally worth the little extra effort. Now, if I’m making pancakes, I put the lemon juice in the milk, melt the butter in the microwave and leave those two things to sit while I cook the bacon, cut the fruit, and pour the juice or whatever else needs to be done for breakfast. Once the milk has thickened and the butter has cooled, I mix the pancakes and the feast begins. This recipe is from Cooks Illustrated—please do follow the note at the bottom when doubling it. Whisk lemon juice and milk together and set aside for at least 5 minutes. In separate bowl, combine flour, sugar, baking powder, soda, and salt. When milk has thickened, add it to dry ingredients and stir. Pour pancakes onto heated, oiled griddle and cook, flipping when bottom is golden brown and bubbles have appeared on top. Sprinkle pancakes with blueberries, banana slices, or chocolate chips before flipping. Serve with maple syrup, berry syrup, chocolate syrup and/or whipped cream. Roll a chocolate chip pancake around a scoop of ice cream, top with powdered sugar and serve as a dessert. This recipe makes about 12 four inch pancakes. When I make it at home, I double the recipe, but I still only use 1 Tablespoon of lemon juice, ONE EGG and 2 cups of flour. Prepare one 9” deep dish pie shell, unbaked. Cut bacon into narrow strips/crumbles. Cook until crisp and drain. Crack 3 eggs into a blender. Add enough half and half to measure 2 cups of liquid—approximately 1 ½ cups of half and half. Add salt and blend. Finely dice green onion and sprinkle into unbaked pie shell. Pour egg mixture over green onion. Sprinkle bacon (or ham or vegetables) over egg mixture. Shred cheese and sprinkle over egg mixture. Sprinkle nutmeg around top of pie. Bake for 45 minutes or until top is puffed and quiche doesn’t jiggle. On a floured surface, roll bread dough into rectangle about ½” thick. Spread softened butter onto dough, going all the way to the edges. Mix cinnamon and brown sugar and raisins, if using. Starting along the longer edge, roll dough—not too tightly or your rolls will pop up in the middle. Pinch edges together to seal seam. Mark 2” chunks, and then slice with serrated knife. Place in greased pan, not too close together. Place in oven. Turn oven on to 350 degrees. When oven reaches 350, set timer for 20 minutes—check, if not done, cook another 5 minutes. Remove buns from oven and spread with icing. Cream icing ingredients together until smooth.